India is known for its traditions and culture. Minority communities in India are known for their traditional skills, arts and crafts.But due to forces of competitive market and globalization, and also due to deteriorating socioeconomic condition of master craftsmen/artisan, these skills are not being pursued by the young generation. Government of India is of firm conviction that these arts/crafts are needed to be preserved. There is a need to augment traditional arts and entrepreneurial skill which are the backbone of cottage and small scale industry and establish better market linkages, enhance branding and ensure access to credit. Therefore, Ministry of Minority Affairs launches a newscheme „USTTAD‟ as 100% Central Sector Scheme. This scheme will be implemented from 2014-15 onwards during 12th Five Year Plan. 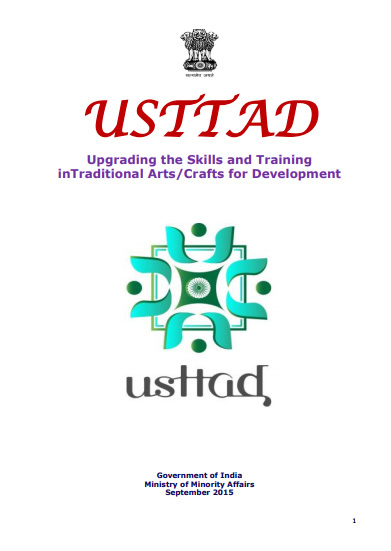 To build capacityof master craftsmen/artisans and training of young generation through the master craftsmen/ artisans for traditionalarts/crafts. Set up standards of identified arts/ crafts and their documentation. To establishlinkagesof traditionalskills with the global market. To improve employability of existing workers, school dropouts etc. To generate means of better livelihood for marginalized minorities and bring them in the mainstream. To ensure dignity of labour. Design development and Research in traditional arts/crafts. The scheme will aim atcapacity building and updating the traditional skills of master craftsmen/artisans.These trained master craftsmen/artisan will train the minority youths in various specific traditional arts/crafts. Ministry of Minority Affairs will take up this skill development programme for all important traditional arts/crafts being practiced byminority communities, for their development and market linkages.